As we approach the end of another year, I’d like to thank my students for another hard year of training. Between having new (clearly dedicated) students joining our ranks and well established, hard training students achieving their 1st Dan, I consider this a great year for the club. We remain small, and train harder for it. I hope next year brings even more opportunities for learning. Please note the final training session of the year is (was, I’m late posting this) Friday 14th December 2018. Training starts at 18:15, and may extend beyond the one hour. I hope to see you all there, and if not, I wish you all a Merry Christmas. We resume training on Friday 4th January 2019. Same time. Same place. Be sure to keep up your training over Christmas! On Sunday 9th December 2018 at the British Wadokai Standardisation Course Part 4 (which covered I-dori, Tanto-dori and Muto-dori) Sensei Oren Teichmann 3rd Dan was awarded Shogo Tashi by Sensei Gary Swift 8th Dan Kyoshi. Titles are often awarded in tandem with grades, however this is not always the case. SHO-GO – 称号 ‘Title’. Refers to the numerous titles that may be awarded upon high-ranking Yudansha. Shogo include Tashi (3rd Dan & 4th Dan), Renshi (5th Dan & above), Kyoshi (6th Dan & above), Hanshi (8th Dan & above), etc. Martial Artists often use Sensei to distinguish instructors of a particular Ryu. Junior and Senior students are often organised via a senpai/kohai system. Other titles are conferred loosely and under no particular standardisation. They often follow the commonly used black belt or Dan system of ranking. The usage of these titles is quite common outside of Japan and is subject to much interpretation. Tashi ( Tashi 達士) Experienced Practitioner. Awarded to those of 3rd Dan and/or 4th Dan who show exceptional skill in their practical, technical and theoretical studies. 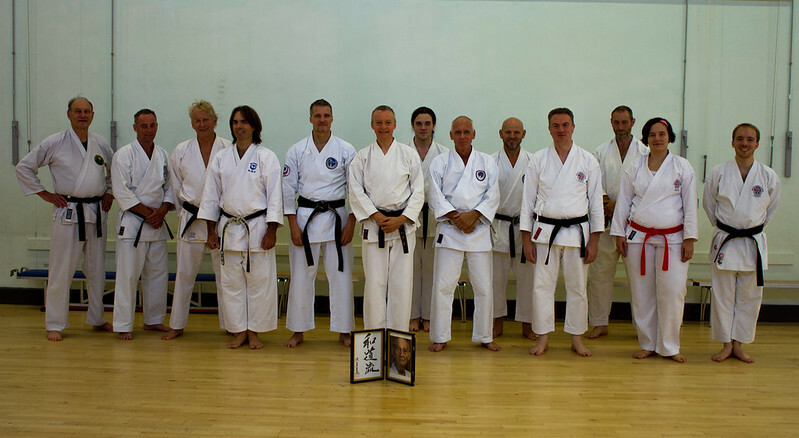 Also awarded at the course was Vita Reizupa’s 8th Kyu grade (passed with flying colours – very much impressing Sensei Gordon 7th Dan Renshi of Horsham DKW). On a personal note, since starting in August this year, Vita has shown great committment and attitude to her martial arts studies, showing up not only in local standardisation courses, but travelling as far as Grey Wolf’s Gloucestershire dojo! I can’t wait to see what she brings to the club next year. Peter Collier 1st Dan, whom if you remember passed his Yudan shinsa in September, was awarded with the ‘Unsung Hero’ award, given for his unusual ability of ‘being here there and everywhere’ just when you need him! All jokes aside, I truly appreciate Pete putting so much time into helping with the club, covering session at the last minute without the dramatic double take I personally enjoy acting out at such a request. Kumite or Gumite? – Confused…? So remember, only when certain words are prefixed does the ‘pronunciation’ sometimes change. However, caution, this rule does not apply all the time, so full investigation must be made. Additionally, it’s also not ‘incorrect’ to allow many of the words/sounds to remain intact. Can you think of any other instances of words, where the Japanese pronunciation may change, when prefixed? Harai (sweep) becomes Barai. Kamae (posture) becomes Gamae. Dachi (standing) becomes Tachi. Kiri (cut) becomes Giri. Koshi (hip) becomes Goshi. Keri (kick) becomes Geri, etc. So with a heavy heart, we get ready to close 2018. Think of what’s to come next year (or in fact, what special big event happens in 2020 that heavily involves karate on a worldwide stage…?) and prepare yourself. I hope everyone gets to enjoy their time off, whatever your plans may entail, and I look forward to seeing you all in the new year. Hello all! On Sunday I was lucky enough to enjoy yet another of the annual Mittsu-ji temple kata courses under Sensei Gary Swift 8th Dan. With around a dozen in attendance, including several from Grey Wolf Karate and from another club within the BWF, Kimesanchin, the 4 hour course managed to cover in detail the kaisetsu and bunkai of the first kata, Jit-te. The remaining two kata, albeit in not as much detail, were edged in to the remaining two hours.